A non-gambler might imagine the casino to be a dingy, smoke-filled basement where booze is trafficked and the sun never shines. That’s how it was. But it might be time to revise your preconception as London’s biggest and newest casino has the gambling joint of old graduated to a centre of entertainment, and this one has turned to art to make its atmosphere new and unique. 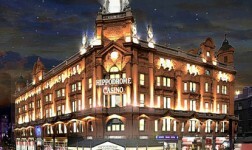 The Hippodrome Casino has commissioned the country’s first digital artist-in-residence, whose task is to capture “the spirit” of the Hippodrome. It seems an anomalous combination – gambling and aesthetics – but it’s in the ethos of a new kind of supercasino this place is introducing. £50m has been spent on restoring the Grace II* listed building to its Edwardian splendour, adapted to the 21st century, with the blessing of the theatre heritage watchdog The Theatres Trust and English Heritage. Not only have the proprietors, octogenarian Jimmy Thomas and his son Simon, hired the digital artist Thomas D Gray as resident, they have already installed his 57-panel digital artwork that surrounds the main void of the interior. The cost of the piece and of value of the residency are not being discussed, but there is evidence of more than a passing commitment to art in the approach of the Thomases to the casino, which they opened 18 months ago in the heart of the West End. Former bingo hall proprietors, the Thomases already have 11 conservation awards for their sensitive refurbishing of former theatres and cinemas. 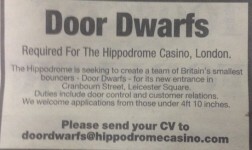 The Hippdrome Casino stands on the corner of Leicester Square and Charing Cross Road. The 114-year-old building was built by the prince of theatre architects Frank Matcham for Edward Moss and his Empire chain, for the then princely sum of £250,000, but it was never actually a theatre; as its name implies, it was an indoor circus that doubled as a music hall. The first show starred a 10-year-old Charlie Chaplin. The galleries were cantilevered, removing view-limiting columns, and it had a retractable glass roof. 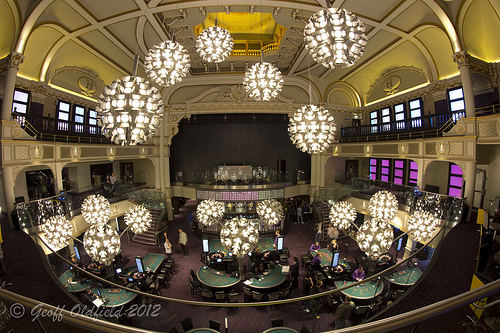 Our latest site-specific video installation is located in the main space of the Hippodrome Casino. 57 independent plasma screens covering 3 walls create an immersive installation experience for viewers on 4 floors. 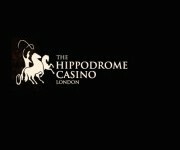 The video installation incorporates all new original content layered and blended exploring multiple aspects of the Hippodrome ‘Experience’. Imagery includes London cityscapes mixed with spinning roulette wheels, Las Vegas classic neon and clowns from the Boom & Bang, Hippodrome’s resident Cabaret Circus. We also have 4 other projects currently on show at the Hippodrome including site-specific interior projections and single screen videos. For next year we are exploring ways to push boundaries further using light art to give visitors even more surprising and interactive experiences as they walk through the building. Update – Thomas D Gray named Artist-in-Residence. Digital Art In Casinos Another Step Towards The Full Vegas Experience ?